Awhile back Kirk and I got talking about bee hives and beekeeping. 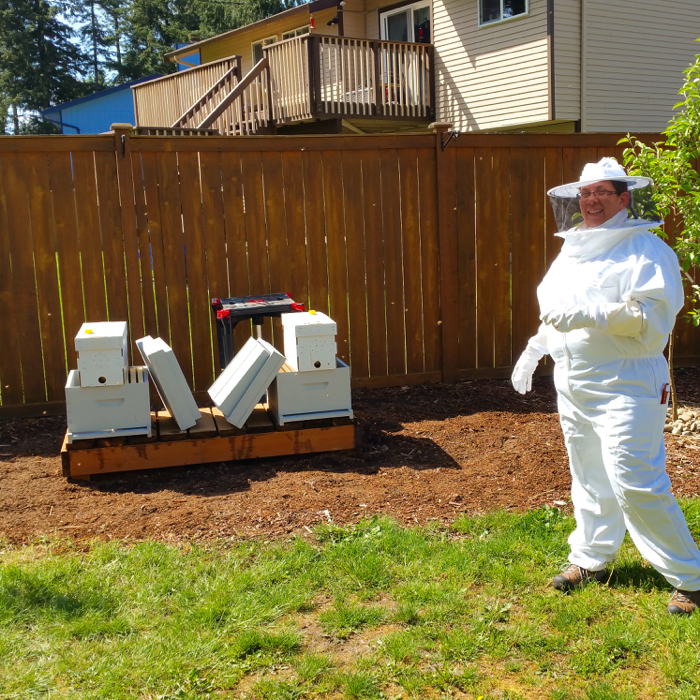 We hemmed and hawed, until Kirk signed us up for bee keeping classes this past winter. If you haven’t watched More Than Honey, I highly suggest it. (PS: You have to turn on the subtitles, it isn’t obvious) It explains in many ways why helping the bees is so important to us. Gardening is very frustrating when nothing is getting pollinated, and this is occurring more as every year passes by. Stop and think….do you see bumble and honey bees often anymore? You may realize that no, you don’t. Don’t go in it for the honey (that is a nice bonus if you get it), but rather to help make our Earth healthier. Honey comb made naturally (not on a bar). 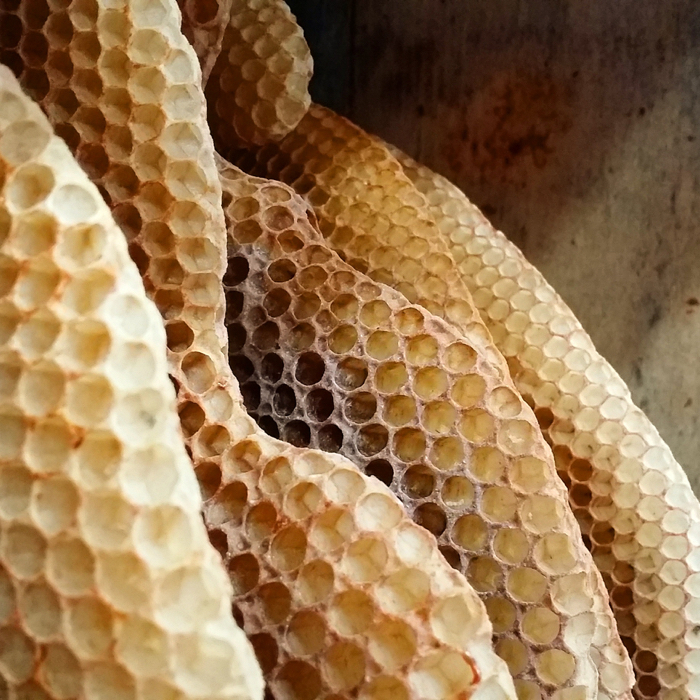 Consider it free-form, what bees do when they make their own hives. Kirk in class, learning the ropes. Early spring was spent getting our hives ready. 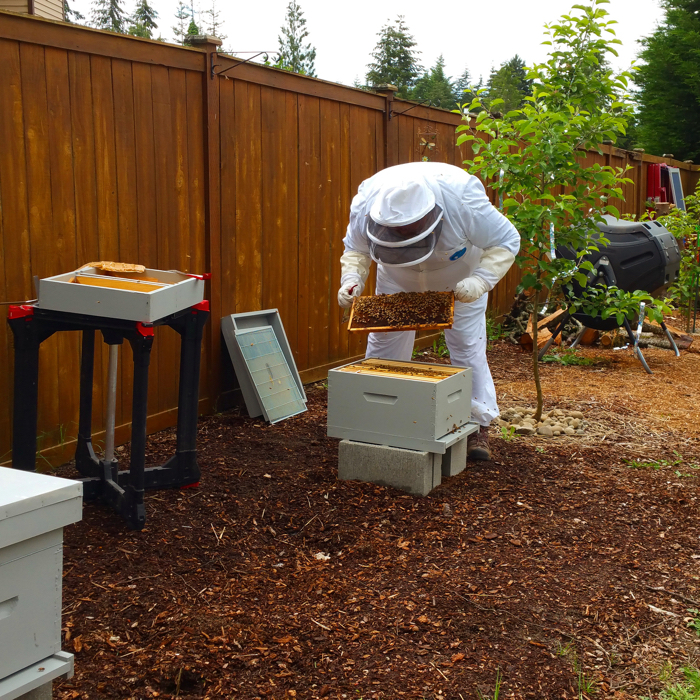 We went for our first 2 hives the Langstroth Hive setup, which is what most people think of when you say ‘bee hive’. Then we had to wait a long, long time to get the call to come get our nucs. 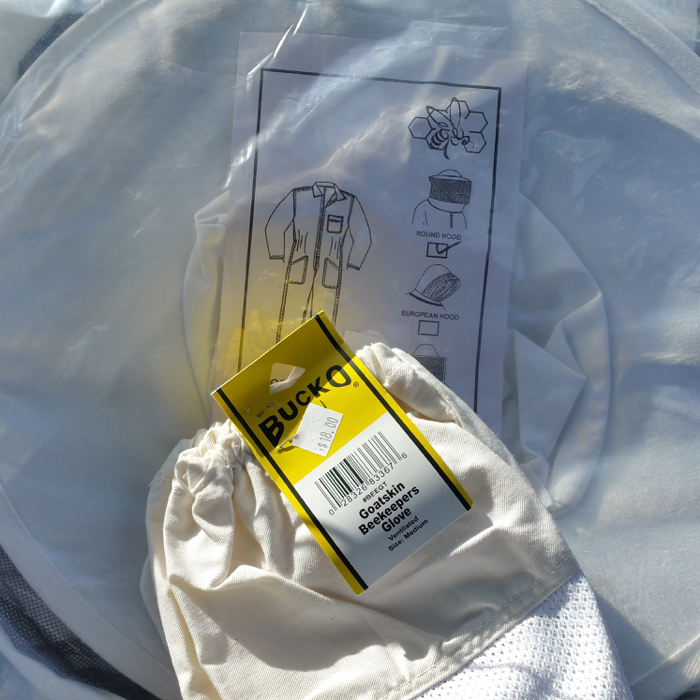 And with that Kirk got me a bee suit, with goatskin gloves. Kirk’s suit has the European style hood, mine is a round hood. He has said he prefers my style, but each to their own – there are a few styles to choose from. With mine I can see all around. 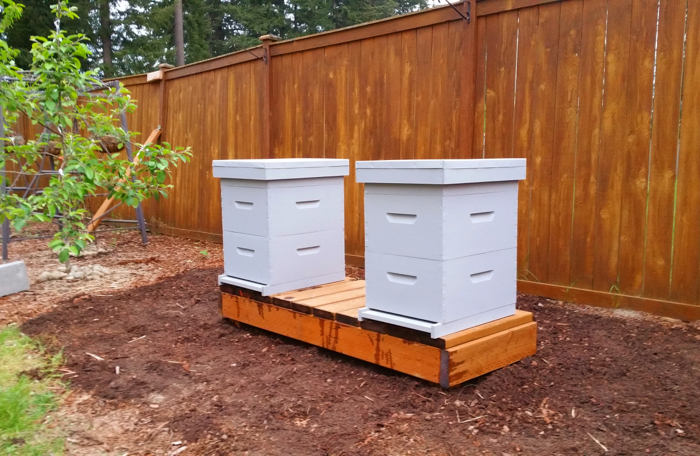 While this isn’t meant to be the permanent spot for the hives, we needed a place to put them until the greenhouse is done. So I cleared out and leveled a section on the fence. Kirk had built a bench for the hives. He ended up taking the bees off the bench, as he was concerned about the stain he used. 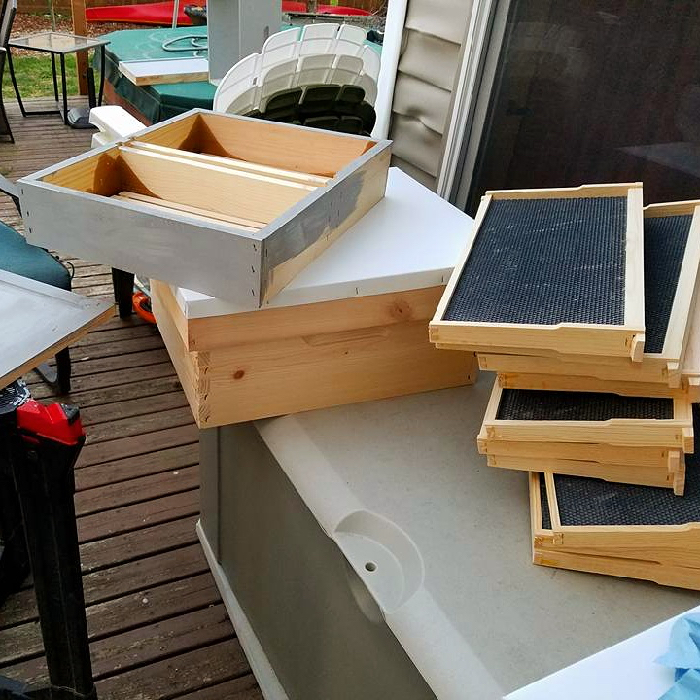 We let it air out for a good two months, and now use the bench to hold supplies while we work on the hives. 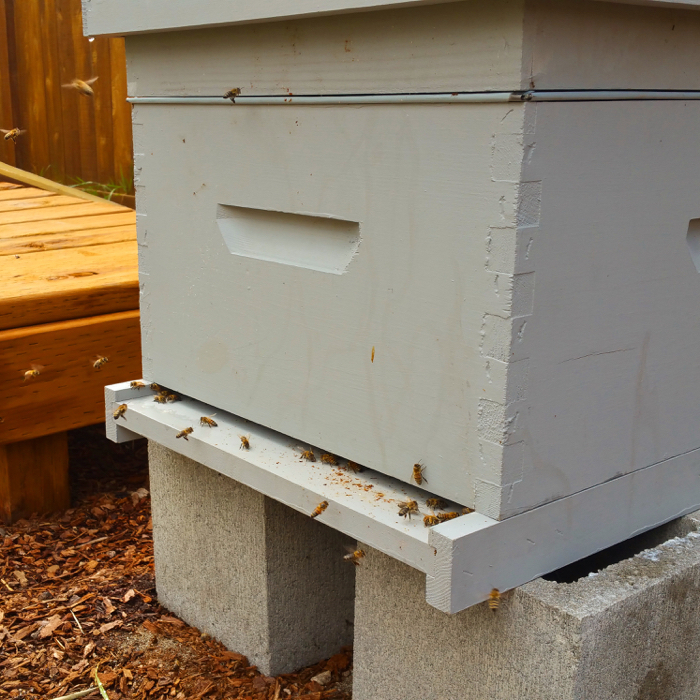 The bees never quit working, even in the nuc boxes. They are tiny golden bees. Incredibly docile and gentle. I save the propolis that we pick off when working on the hives, and have a collection jar. 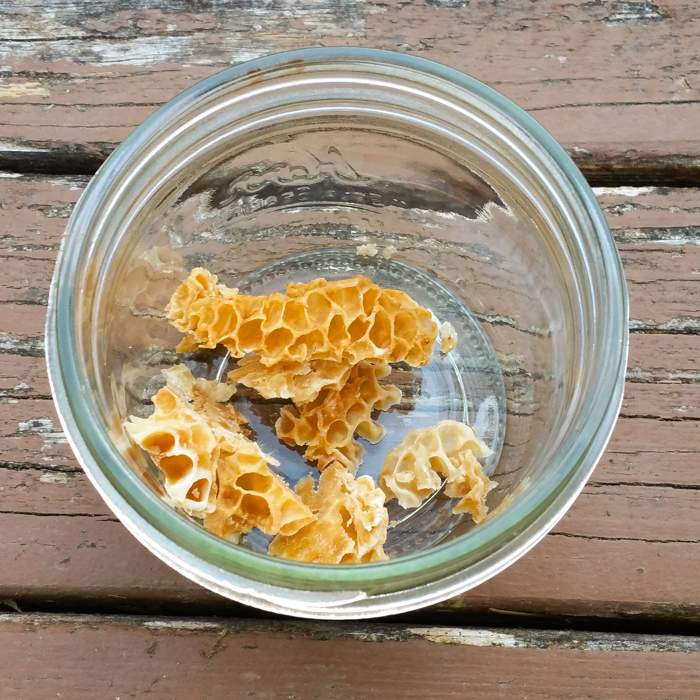 When we get to the point of harvesting beeswax, I’ll add it in to melt it down. The girls at work, coming in with pollen on them. 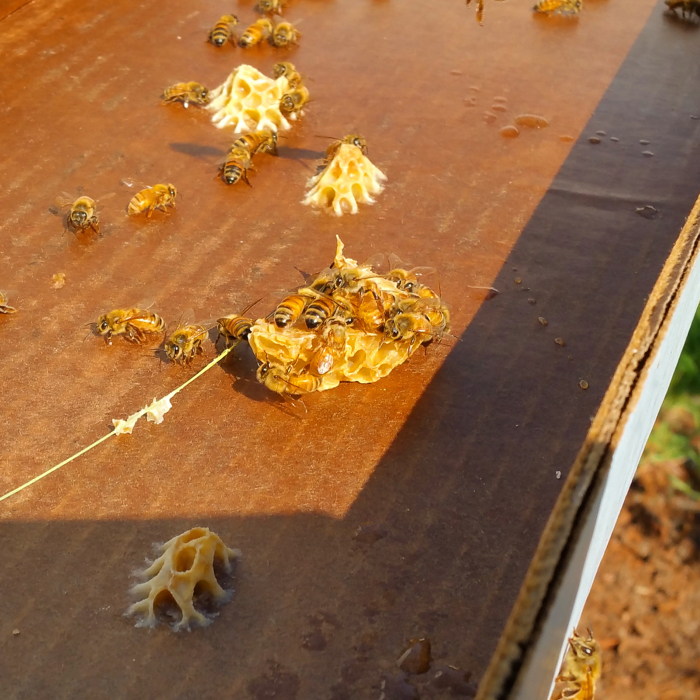 The bees as they were cleaning out the sugar syrup container in the nuc box. Things of course never go quite the way you plan. 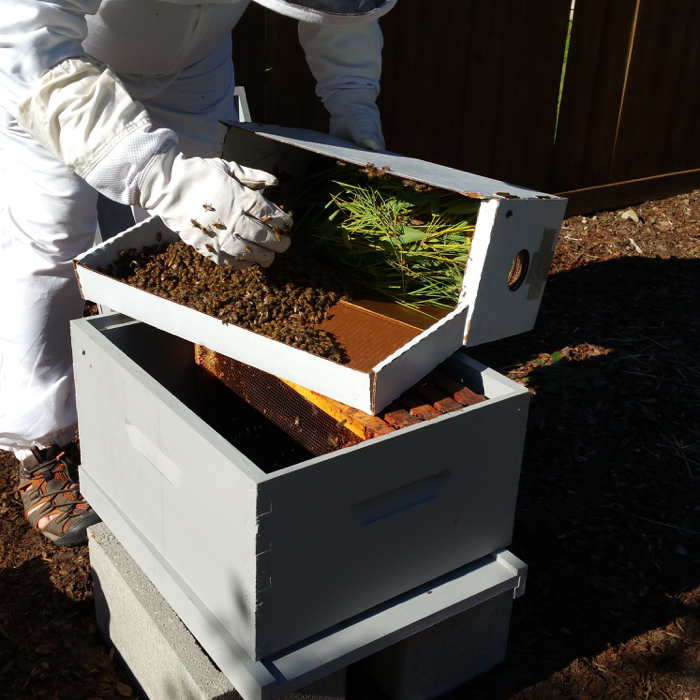 We had a lot of success at first, but then we noticed one of the hives wasn’t as active. Then I realized I wasn’t seeing nearly any bees at all. We cracked it fully open, and realized that sadly we had lost a hive. The consensus was the queen was either dead on arrival, or died not long after. It had a shy month, then the bees died off. Without a queen they cannot go on. While you can see bees, the numbers were very, very low. The key thing was no babies. We talked to who we had bought the nucs from, and they were willing to warranty it. It was too late to put in a new nuc, they just wouldn’t have time. So we agreed, come next spring. 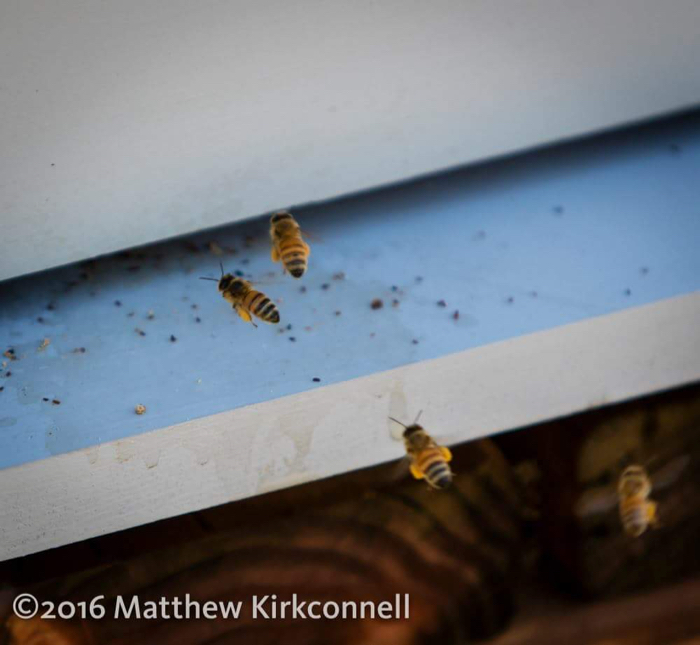 Then Kirk got a call, they had caught a swarm from one of the hives, did we want it? What did we have to lose really? 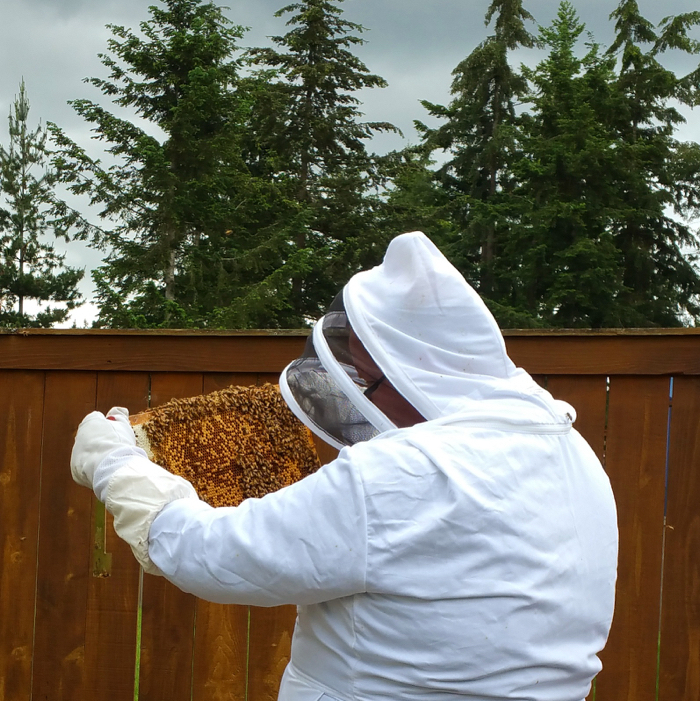 We picked up the swarm, got the hive ready (we added in comb that was built up, to make it even a better deal for the bees), fed them well with simple syrup, and let them get settled in. For now they seem happy. We shall see what happens. We know we have a queen (Kirk saw her come out twice to orient herself). 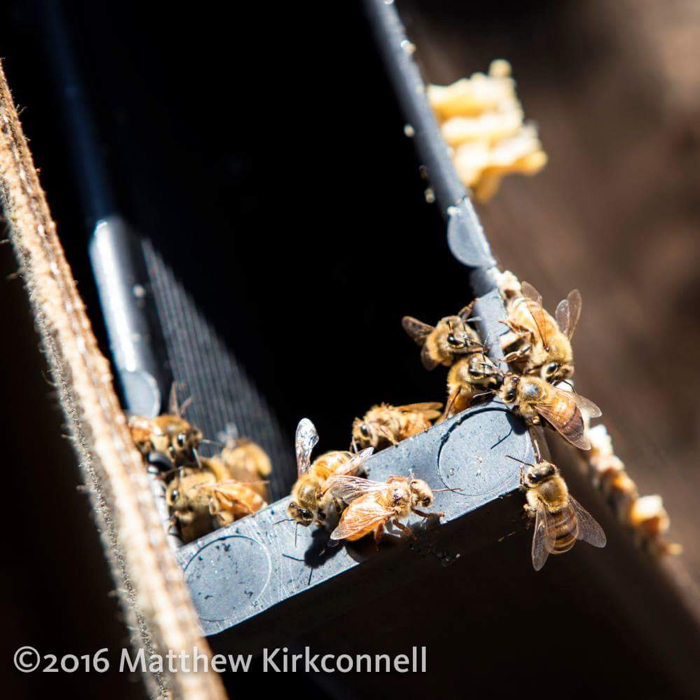 The bees are cleaning the hive like crazy, and more so, are drinking a lot of syrup. If you look at the entrance you can see how much they have cleaned the hive. A few weeks has passed now (almost a month). We saw a new queen cup awhile back, meaning she has been doing her job, getting ready to replace herself. 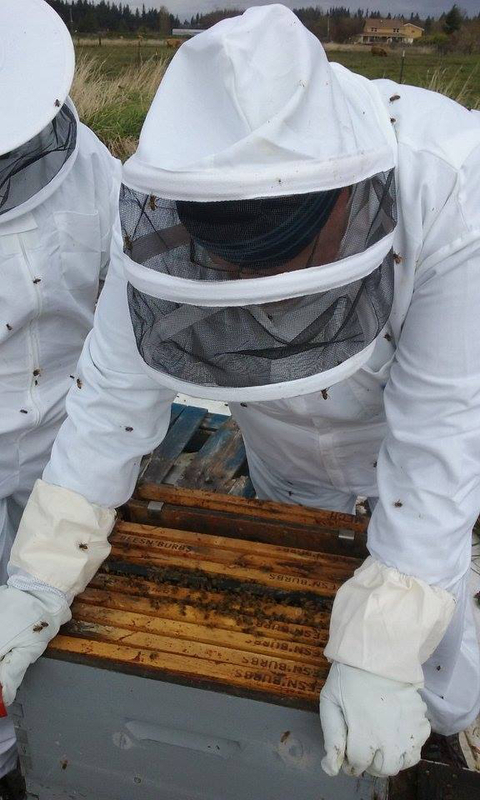 Soon we will check on the hives again (we do about once a month) to see how the queens are doing. 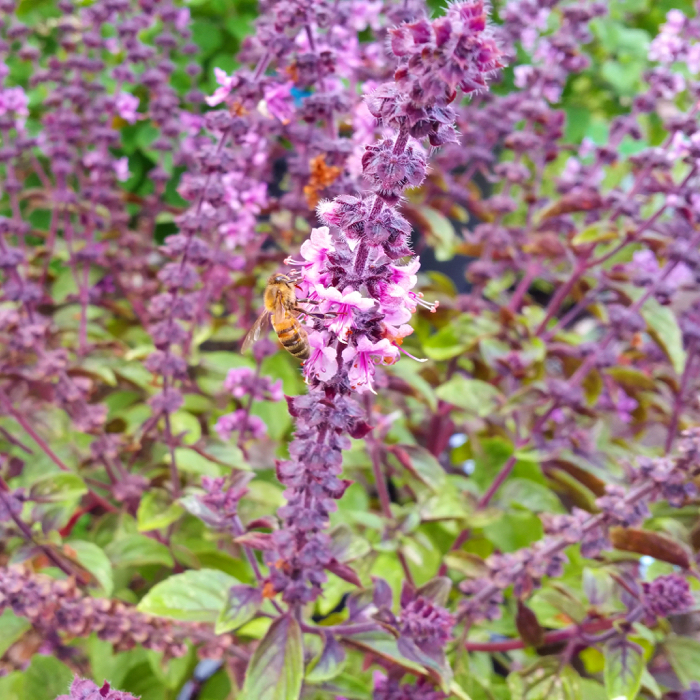 The bees though, they keep themselves busy, doing what is their job, their meaning in life…..
And let it be known, they really, really love Basil. Next year I will grow a 100 plants for them. What my babies want, they get! Bees need a LOT of water. This might not seem obvious either. I’ve had bee baths around the gardens for years, as a way to give to them and other pollinators. Once you make them, as time goes on, you will notice a lot of bees, mason bees, butterflies, and even birds using them. I have one that the squirrels use even. Since we have a lot of yard, I have 2 in the front, 8 in the back, along with 3 bird baths that are for the large birds (the crows love them). I try to flush them at least every other day, to ensure fresh water, but also no mosquitoes breeding. Flowers. Well…there was a learning curve. I like flowers and all, but they have never been my focus. Until this year. 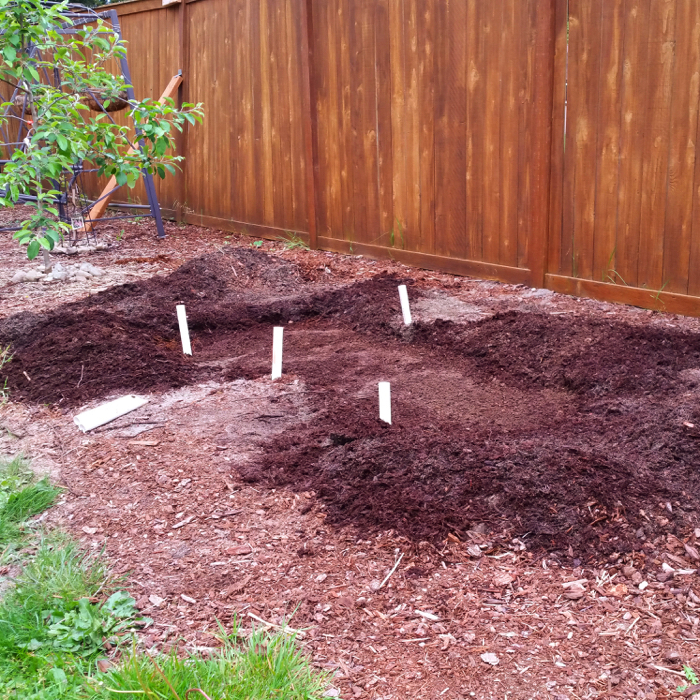 I’ve realized we need a lot more perennial flowers in the ground, and have worked on it. The bonus is the bland spots in our yard (along the fences for example) are much cheerier now! A mix of hardy ones like Daisies, plenty of types of Lavender, many herbs (I’ve let them all go to flower stage this year), and annuals mixed in. I even planted a number of bulbs this year out front. I am working on having a steady supply of flowers from late winter to late fall. Much to do! 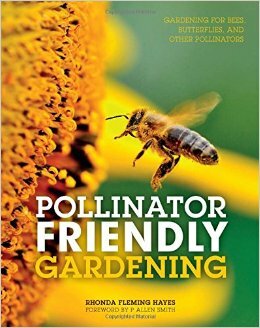 This was a great resource I picked up this year: Pollinator Friendly Gardening. Lots of great ideas and resources. Neighbors: If you explain to them what you are doing, and how it benefits them, they will be so much more receptive. Most people think of “bees” as hornets, wasps, and yellow jackets. Once they realize it isn’t those jerks, they are not so scared! But you do need to beg a lot that they not use crap sprays, such as Round Up and similar, near fence lines. 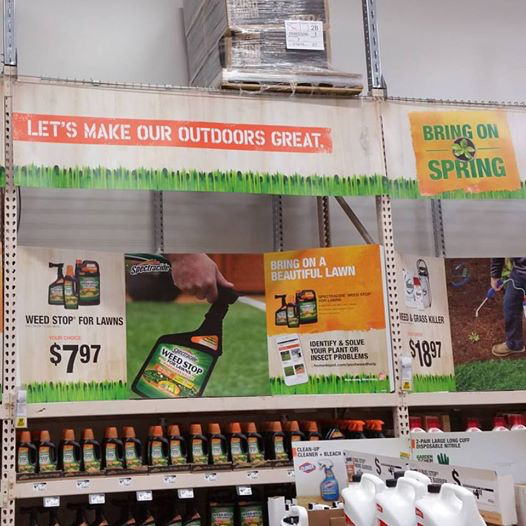 Because according to The Home Depot, unless you use this crap, the outdoors won’t be great. It’s a full time job to reverse this level of brain washing! Sell them on that your girls will give them fruit and vegetables if they have them……or that you’ll share yours! If the thought of maintaining hives is too much or you don’t have the space, consider the gentle giant, the mason bee. They stick close to their homes, and while they don’t produce honey, they are powerhouse pollinators. 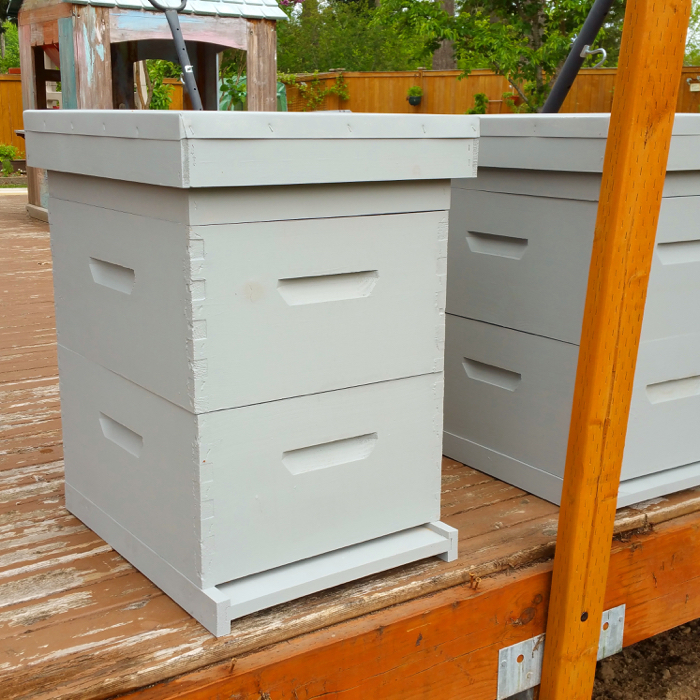 You will want to encourage them with a water supply, a way to make mud, and a home – be it a mason hive or a pile of wooded mess. Encourage them!